For the past 50 years, retirees have been flocking to Arizona retirement communities and more than 13.3 million people visit every year. The ever-increasing population of older adults retiring to the state has led to a boom in the number of active adult communities in Arizona. Many people are lured to the year-round sunshine, abundance of recreational and cultural attractions, and a relatively affordable cost of living. At 113, 998 square miles, Arizona is the sixth largest state in its region. Due to its large area and many different elevations, there are a variety of climate conditions throughout the state. Areas with lower elevations mainly have a desert climate with mild winters and very hot summers. Northern Arizona has significantly higher altitudes than the lower desert areas and it experiences a cooler climate with cold winters and mild summers. In general, Arizona has a primarily dry climate with an average rainfall of 12.7 inches per year. Known best for its desert and mountain landscapes, Arizona offers spectator views throughout all areas of the state. The Sonoran Deseret covers the southwest area while the Chihuahuan Desert is a small part of the southeastern state. The Mojave Desert is located in Northwestern Arizona while the Painted Desert is located in Northern Arizona. The state is fairly mountainous and has many mountain ranges that exceed elevations of 9,000 feet. With 194 named mountain ranges, Arizona communities boast some of the best views in the nation. 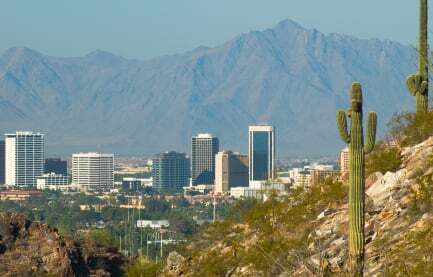 Phoenix, Tucson, Prescott, and Yuma are the four largest metropolitan areas in Arizona. Near these cities you will find an abundance of entertainment that vary from sports to arts and culture. Professional sports including the Arizona Cardinals, Phoenix Suns, Arizona Diamondbacks, Phoenix Coyotes and more are just some of the popular teams. Due to its warm climate, Arizona is a popular location of Major League Baseball s spring training facilities as well. In regards to art and culture, there are many museums and centers for art throughout the state. Rich with Native American history, Arizona is recognized for its galleries that show historical and modern work. Known as the Grand Canyon State, Arizona is filled with outdoor parks and recreational opportunities. Northern Arizona has some of the best hiking, biking, and sightseeing with snow-capped mountains and thick forests. North Central Arizona is filled with mountain retreats, shady trails, and lakes and rivers perfect for camping and fishing. The Phoenix and Central Arizona areas have both a wet and dry climate and offers diverse animal life for animal watching. Tucson and Southern Arizona is home to caverns, caves, hiking, trails, rocking climbing, mountain biking, and top-notch golfing. Arizona s west coast is home to Lake Mead and Lake Havasu for boating and great wildlife watching. The cost of living in Arizona varies by city and region. The state of Arizona s cost of living is cheaper that the US average, however it is relatively higher than most states. As of 2014, the median home value in Arizona is $178,300; this value has gone up 9.7% in the past year. Arizona has no tax on Social Security benefits and there are exemptions for some retirement income. When it comes to property tax, Arizona residents have no state tax and are only responsible for local taxes. There is also no state tax on food for home consumption or prescription drugs. There are 114 hospitals in Arizona, four of which are nationally ranked. Arizona s nationally ranked hospitals include the Mayo Clinic in Phoenix, University of Arizona Medical Center in Tucson, Scottsdale Healthcare Shea Medical Center in Scottsdale, and St. Joseph s Hospital and Medical Center in Phoenix. The greater Phoenix ares is renowned for its medial research and treatment facilities. It's home to well-known medical experts that attract people here from all over. There are many companies in the state that specialize in heath-related fields like cancer research, pharmaceuticals, biotechnology, and more.